“Many vendors are offering molecular biology enzymes, kits, and reagents globally to support the demand. For example, Lucigen is offering products like cloning kits and vectors, modifying enzymes, and reverse transcriptase enzymes. New England Biolabs is also offering a comprehensive menu of reagents for use in DNA sample preparation, RNA sample preparation, and PCR applications. The increasing advances among several other vendors will drive the growth of the market during the forecast period,” says an analyst at Technavio. 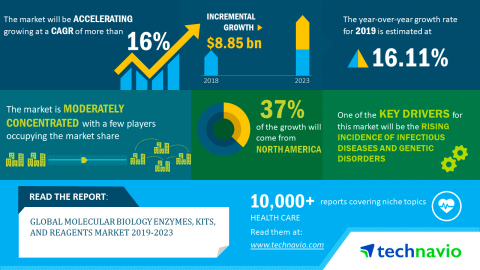 More From BioPortfolio on "Global Molecular Biology Enzymes, Kits, and Reagents Market 2019-2023 | 16% CAGR Projection Over the Next Five Years | Technavio"